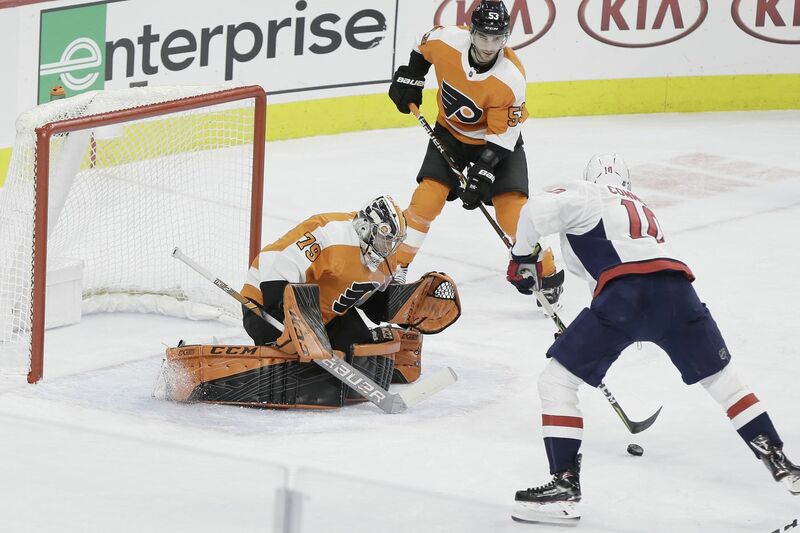 Carter Hart makes a save in the second period of a recent game against Washington. The rookie will likely play most of the Flyers' remaining games. PITTSBURGH — The Flyers know the odds are astronomically against them sneaking into the Stanley Cup playoffs. Sports Club Stats gives them a 2.6 percent chance and, considering they are six points behind (seven if the tiebreaker has to be used) with 10 games left, that sounds about right. Then again, the Flyers probably overcame greater odds to register dramatic comeback wins in their last two games against Pittsburgh. In fact, they became the first team in NHL history to beat a team twice in the same season when they overcame a deficit in the final 30 seconds of regulation both times, including Sunday’s stirring 2-1 overtime win over the host Penguins. Hence, to them, their playoff deficit seems steep but not impossible. The Flyers are seven points behind Carolina, the top-wild card team, and six points behind Columbus, which holds the second wild-card spot. They are also three points behind Montreal, which is trying to get into a playoff spot. Carolina has 11 games left, including two with the Flyers, two with Washington, two with Pittsburgh, and one against powerful Tampa Bay. The Flyers (five home, five away), Columbus (three home, seven away) and Montreal (five home, five away) each have 10 games remaining. Columbus starts a three-game swing through Western Canada on Tuesday in Calgary. The Blue Jackets also have difficult games against Boston, Nashville, the Islanders, and Montreal. As for the Flyers, their Must-Win Tour continues Tuesday against the visiting Canadiens. They also have upcoming games in Chicago (Thursday), against the visiting Islanders on Saturday, and in Washington on Sunday. After those four games, they will either still be in the race or making tee times for early April. Hart, who stopped 40 of 41 shots in Sunday’s win in Pittsburgh -- it was arguably the best performance of his young NHL career -- is expected to start most of the remaining 10 games. “Fun” is not the word that comes to Hart’s mind when he thinks about the last time he faced the Canadiens, a 5-1 loss in Montreal on Feb. 21. Hart injured his ankle in warmups but thought he could play through it and didn’t tell the coaches. He was then shelled for three goals on nine shots and had an early exit before missing three weeks. Now he is expected to get his second straight start Tuesday and have a chance to redeem himself. With 1:17 left in regulation and the Flyers facing a 1-0 deficit Sunday and Hart pulled for an extra attacker, Ivan Provorov made a diving play to knock the puck away from Pittsburgh’s Nick Bjugstad and prevent an empty-net goal. “I had no doubt in my summer training,” Provorov said of his mad dash to catch Bjugstad. … Drained by flu-like symptoms, Claude Giroux was unable to participate in the morning skate Sunday, but he had an IV administered before the game and was in the lineup. “It was a big game. I think everybody in the locker room would have done the same thing,” he said. Giroux got more minutes as the game progressed and finished at plus-2. He had six shots, all after the second period.